Farm, barn and winery weddings have become very popular. 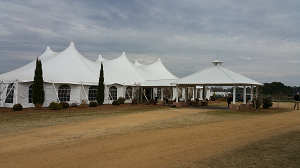 As a result new wedding venues are popping up at farms to accommodate the demand. Some are better at it than others. Here's what you need to know and considered before choosing a venue for your wedding. No point in considering a farm or winery further if it simply cannot handle the number of guests you expect. And keep in mind that guest lists tend to grow as the date approaches. Do you like it? This is about making memories, so it should match your vision. Can you picture it with string lights around the barn dance floor?. Are there scenic views, farm animals, paths for guests to walk? How many weddings have they done? Size of them? Can you talk to some of the former clients? If you are their first wedding.. it could be a disaster... or you could negotiate a deep discount. No all farms have indoor plumbing. Will your guests be using porta-potties? Is there a private enclosed, weather-proof dressing area for bride and her party? The groom? You hope for a beautiful sunny day, but it could be freezing cold, searing hot or windy pouring rain. How will the venue handle these conditions? Will you and your guests be warm enough, cool enough or dry? Some venues have wedding suites, guest houses and other accommodations. If not, how far away are the overnight accommodations for you and your guests? Zoning or farm operations could conflict with your plans. Be sure to find out the exact houirs the venue is yours. Parking - enough and good for your guests vehicles? If it rains, will it be a muddy field? Allergies - is it near a field of goldenrod? Do they have an adequete electrical power supply to power your DJ, lighting and everything else? Do they have any rules or restrictions that you cannot live with? Some of these come from legal and safety requirements and can't be changed. Do you have any handicapped guests and can the venue accomodate their needs? How much of a deposit is required, what is the fee, what is included and what is the refund policy. You can also ask about discounts for less popular dates.